Durban – Race six of the 2019 Marine Surfski Series went off on its traditional pre-FNB Dusi Tuesday slot at the Lettie Love Fund Surfski Challenge and a brilliant field took part in the mid-week hit-out with Matt Bouman and Kyeta Purchase taking the men’s and women’s race wins. 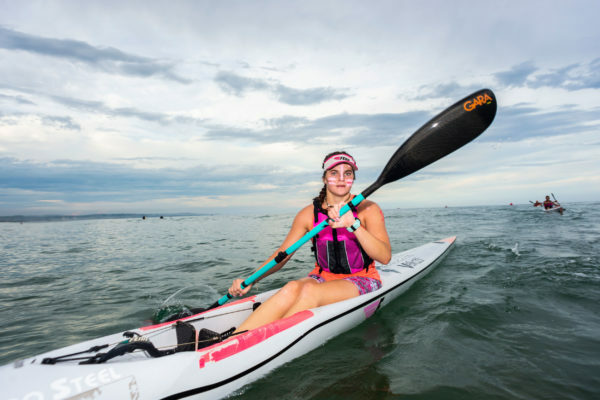 In what were the best conditions of the series to date, paddlers came in their numbers on a warm Durban evening for what was a display of the depth of paddling in the province as Bouman managed to pip the visiting Dawid Mocké to the race win. The veteran has spent the series chasing Hank McGregor, however not having the ocean racing hero to battle it out with Bouman was up against one of the Western Cape’s finest in Dawid Mocké. Bouman showed his experience and knowledge of the local conditions as he won the race by over a minute from Mocké with perennial top fiver Gene Prato coming home in third. The ladies race was another exciting tussle with Kyeta Purchase and Michelle Burn fighting it out for the race honours, and it was the younger Purchase who won the arm wrestle to take her second win of the series. Burn’s second is her fourth second place finish of the series. Finishing third in the ladies race was the ever-consistent Lyn Bennett. “These conditions just showed off what Durban has to offer during the summer,” race organiser Barry Lewin said. “We’ve had some stunning conditions for the series so far but today tops it out. “There was not a cloud in the sky and it was such a warm evening down there today. The series has continued to unearth ocean racing talent and with some of the country’s best fighting it out on a weekly basis there are few better paddlers to learn from than the likes of Bouman and McGregor. In the past the likes of Wade Krieger has fought it out for the race honours, however there are a handful of paddlers that have leap-frogged the veteran with the likes of Gene Prato fighting it out these days for the podium spots. Winning the doubles race and finishing second overall was the pair of Jason Ekstrand and Bryan Leroux. Quinton Rutherford and Matt Elliott where the second double home while Colin and Joshua Simpkins finished in third. In the short course it was Shaun Burgin and Paige Dennison took the race honours and they were followed home by Lance and Gabi Howarth and Reynard van Antwerpen and Kendra Robinson in third. The Funky Pants Family Feud continued to dish up the goods with a number of parent/child crews taking on the Durban surf on Tuesday and have been since race one of the series. Race 7 of the 2019 Marine Surfski Series is the Funky Pants Surfski Challenge on 22 February. More information can be found at www.marineseries.co.za.